Adapter protein that plays a role in regulating cell-surface expression of adrenergic receptors and probably also other G protein-coupled receptors (PubMed:20559325, PubMed:21982743, PubMed:23208550). Plays a role in NEDD4-mediated ubiquitination and endocytosis af activated ADRB2 and subsequent ADRB2 degradation (PubMed:20559325, PubMed:23208550). May recruit NEDD4 to ADRB2 (PubMed:20559325). Alternatively, may function as adapter protein that does not play a major role in recruiting NEDD4 to ADRB2, but rather plays a role in a targeting ADRB2 to endosomes (PubMed:23208550). 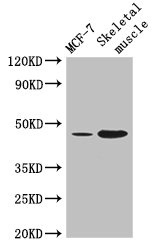 ARRDC3 Polyclonal Antibody. Unconjugated. Raised in: Rabbit.